Lindsay tweeted me about the post which I had no clue about. To say I was shocked was an understatement. I am extremely flattered by AT's very kind words. We just do what we do over here and hope you like what you see, so to have Apartment Therapy call our whole house an inspiration is, well, mind blowing and completely unexpected. 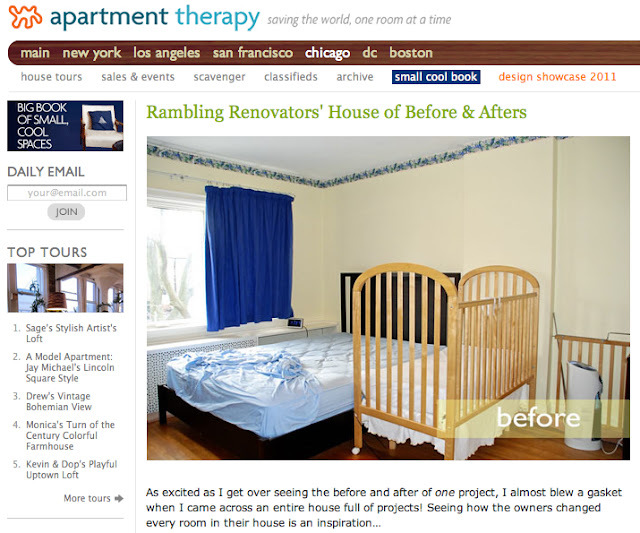 Thank you Apartment Therapy and welcome to all you folks who wandered over here! You may have noticed the new Before & After photos in the article. I was going to do a post about it, but there's no time like the present to let you know about the revamped "Our House" page. If you mosey on over there, you'll see an expanded history of our renovation journey. Its a bit of a timeline of our house and this blog. As well, I'll soon be adding a Sources page so you can find out where we got our furnishings, paint colours etc. in case you wanted to know. All this to say, its been one heckuva weekend here at the Rambling Renovators household. Thank you for all your kind and encouraging comments on my last post. You mean the world to me :) And it looks like the exciting times I spoke of were here before I knew it!